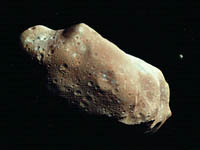 The asteroid Ida and its newly-discovered moon Dactyl, photographed by NASA's Galileo spacecraft. Ida is about the size of a large city. [Click for a larger image.] Photo: NASA. By chance, ground zero is the Canadian prairie, and the meteorite (as it's now called) smacks into the earth with the force of nearly one million megatons of TNT, carving out a crater ten miles across and several thousand feet deep. The enormous force of the impact momentarily compresses the ground, which springs back like a rubber handball, releasing a catastrophic explosion of dust, melted soil, and gases. The energy released from the impact heats the atmosphere, and grasslands and forests as far south as the equator burn to the ground within hours. Most of the meteorite is vaporized, and dust from the impact is thrown into the stratosphere, blocking the sun and dropping global temperatures about 18 degrees Fahrenheit. Photosynthesis is virtually halted; plants wither, and the animals that depend on them perish. For up to a year, farming is futile and mass starvation sets in. Cockroaches, rats, and other detritus-feeders survive and prosper on the decaying plants and animals. Comet Hyakutake was discovered in 1996 by an amateur astronomer in Japan using only binoculars. The comet put on a spectacular display that year, becoming the brightest comet in 20 years. [Click for a larger image.] Photo: NASA. ound like the doomsday script of the newest Hollywood blockbuster? It's actually a probable scenario built upon the prediction that a cosmic collision may be in our near future. On March 11, 1998, Brian G. Marsden of the Minor Planet Center at the Harvard-Smithsonian International Astronomical Union made that startling announcement. In a press release, he reported that in the year 2028, an asteroid called 1997 XF11, discovered by Jim Scott of the Spacewatch program at the University of Arizona, would pass within 30,000 miles of the earth, the width of a cat's whisker in astronomical terms. 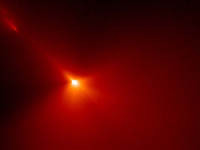 The preliminary orbital calculation was based on observations made by three additional astronomers, and Dr. Marsden stated that, although the chance of a collision with earth was small, it was not out of the question. In his announcement, Marsden, a respected expert in the field, appealed to the astronomical community to search their photographic archives for more observations of the asteroid, with the hope of determining the object's exact orbit.